What’s It About? Toys, dummies and similar have been a staple of the horror genre for many years. You only have to look at Chucky in Child’s Play or Billy the Puppet in the Saw franchise to know just how creepy they can be. Even something like the Autons in Doctor Who share the same eeriness that comes with inanimate objects coming to life in one way or another. Whether it’s a fully-fledged character or simply a slight movement or sound, there’s no doubting the power of something so simple. Re-released under the ArrowDrome label, focusing on selected cult movies that may have passed you by, the 1989 horror Pin stars Terry O’Quinn (Lost) as Dr. Frank Linden. 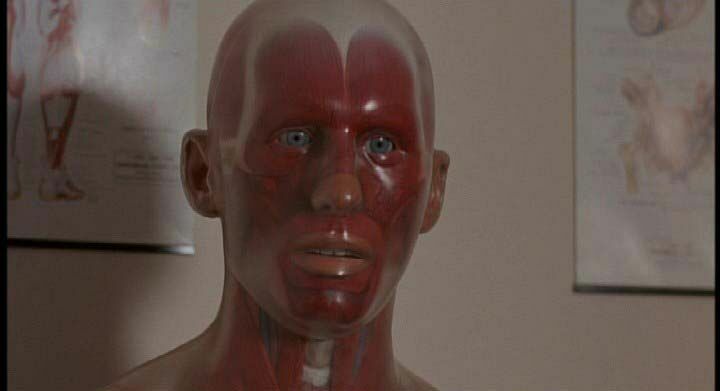 In his role as a doctor, Linden uses the anatomically correct dummy to teach his own children about the human body and its functions. This sounds all nice and normal but things soon take a turn for the worse. Alongside O’Quinn, his son Leon is played by David Hewlett of Stargate and Cube fame. Hewlett takes the primary role in Pin as Leon is fixated with the dummy’s presence, believing him to be alive. Leon has a personality disorder which leaves him struggling with reality and so his father’s ventriloquism with Pin suddenly becomes far too real to him. What follows is a mysterious mix of horror and psychological terror with a real human element, as we the audience are never quite sure whether there’s something more to Pin or if it’s just a delusion in Leon’s head. Leon’s sister Ursula (Cynthia Preston) tries to be loyal to her clearly tormented brother, yet he twists and turns at every moment and becomes highly overprotective. Trying to lead a normal life, Ursula and those close to her are put in harm’s way by Leon’s mental breakdown. The further Leon steps away from reality, the further events spiral out of control and we see more of Pin’s dangerous side. The line between imagination and the real world fades away, and Pin becomes a truly terrifying prospect. 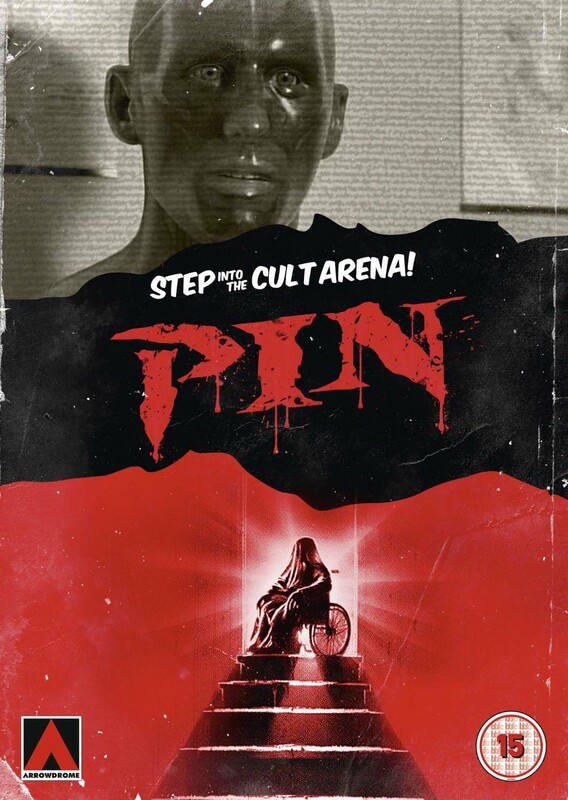 Verdict: For any horror aficionado, Pin is your typical 80s movie, and this isn’t a bad thing. The lower quality production values lend themselves to a grittier and darker tone compared to the glossier pictures of today. There’s nothing subtle about Pin, as everything is on the surface and clear to see in terms of Leon’s breakdown and the fact he should really be getting help far before any of this happens! Pin is an entertaining albeit strange movie to watch, and one worth a viewing over Halloween at least, and while it never quite scales the heights of a great horror movie, it muddles its way through to a watchable ending. Extras: Other than the original theatrical trailer, you also get a reversible sleeve of original artwork and a collectors booklet. A small yet welcome bonus for genre fans. Final Words: Pin never won any awards and that isn’t surprising. Horror movies very rarely do, and arguably horror is a genre more guilty than any of cheap sequels and bad ideas. Pin at least attempts to do something a little ambitious, even if it doesn’t achieve it as well as it could. Pin won’t be on a top 10 list anytime soon, but it’s a curious movie that almost has to be seen to be believed. It’s disturbing in many ways, not all good, but will certainly leave an impression on the viewer, and you won’t want to go round the Linden’s house for dinner anytime soon. Pin is available on DVD now.